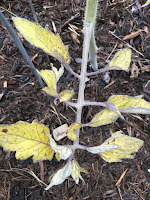 Growing Southern | Garden Blog: Yellow leaves in tomato plants? Yellow leaves in tomato plants? It might be overwatering! I let up on watering these tomato plants and within a couple weeks they recovered. This experience reminded me of my repeated failure with cilantro. Not only did I learn from those mistakes, but also I learned so much from visitors after sharing my struggles on this blog. What have YOU learned from a garden mistake lately? the first failure is the beginning of education."